Addis Ababa, March 15, 2012 (Addis Ababa) – The Ethiopian Defense Force announced Thursday that it has destroyed Eritrea’s three mercenary camps.Indoctrination and Public Relation Center Head with the Defense Ministry, Col. Gebrekidan Gebremariam told journalists here on Thursday that the Ethiopian defense force successfully annihilated the destructive force of the Eritrean government based in Ramid, Gelahben and Gembe areas which are close to the Ethiopian border. 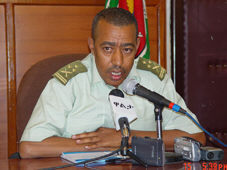 Col. Gebrekidan said the Ethiopian defense force would continue to take such measures until the Eritrean government and its mercenaries refrain from their subversive activities. He said detailed information concerning the issue would be made official soon. Col. Gebrekidan said that the Eritrean government is engaged in an activity bent on destabilizing the peace and security of Ethiopia. He also recalled the Eritrea’s mercenaries had killed foreign tourists while visiting Afar. Ethiopia has been examining the situation and now it has made appropriate counter attack to stop the Eritrean government from such destructive acts. Posted on March 15, 2012, in AFRICAN NEWS, ETHIOPIA ENGLISH, WORLD NEWS. Bookmark the permalink. 1 Comment. Down with the Eritrean government!